An exhaustive analysis of fatty acids from a diabetes-protected animal model has revealed a whole new class of molecules. These molecules, dubbed fatty acid hydroxyl fatty acids, or FAHFAs, enhance insulin sensitivity and glucose control. Better yet, they also reduce inflammation. Ordinarily, elevated fatty acids are associated with insulin resistance and glucose intolerance, which in turn are associated with diabetes and metabolic disease. 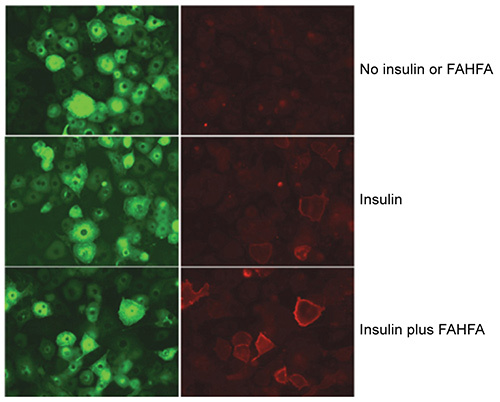 Yet elevated FAHFAs have been found to account for enhanced insulin sensitivity and improved glucose control in a specially engineered mouse strain. FAHFAs thus join a small collection of beneficial fatty acids alongside the omega-3 fatty acids. Unlike the omega-3 fatty acids, which are found in fish oil, the FAHFAs are made in mammals. In fact, they are found in fat cells as well as other cells throughout the human body. FAHFA levels can even be detected in the blood. All of these facts auger well for therapeutic development, say the researchers who discovered the FAHFAs. These researchers were led by Barbara Kahn, M.D., vice chair of the Department of Medicine at the Beth Israel Deaconess Medical Center (BIDMC) and the George R. Minot Professor of Medicine at Harvard Medical School, and Alan Saghatelian, Ph.D., a professor in the Clayton Foundation Laboratories for Peptide Biology at the Salk Institute. “These lipids are amazing because they can also reduce inflammation, suggesting that we might discover opportunities for these molecules in inflammatory diseases, such as Crohn’s disease and rheumatoid arthritis, as well as diabetes,” added Dr. Saghatelian. The lipidomic analysis relied on mass spectrometry technology to quantify hundreds of lipids from biological samples. Four of these lipids turned out to be of particular interest because they were elevated in the engineered mice but not in normal mice. Although they could not be found in the existing databases the scientists consulted, their structures were ultimately elucidated via tandem mass spectrometry (MS/MS) and confirmed via chemical synthesis. Additional experiments revealed that feeding the mice extra FAHFAs resulted in a rapid and dramatic drop in blood sugar and rise in insulin. They also looked at FAHFA levels in human fat and plasma, studying samples from individuals who were known to be insulin resistant and at high risk for developing diabetes. In this case, FAHFA levels were found to be 50–75% lower than levels in people with normal insulin sensitivity, suggesting that changes in FAHFA levels might be contributing to diabetes. The researchers also identified GPR-120, the cellular receptor that FAHFAs bind to. “When FAHFAs bind to GPR-120, they are able to control how much glucose is taken up into fat cells,” explained Dr. Kahn. The receptor may also be responsible for the effects of the novel lipids to reduce widespread macrophage activation, which is associated with obesity and with inflammatory diseases.